1 of 4 Shake soy sauce and syrup in plastic resealable food storage bag to mix. Add salmon. Close; refrigerate 40 minutes. 2 of 4 Microwave sweet potatoes on HIGH for about 5 minutes, until slightly tender; let cool. Cut diagonally across into 1/4- to 1/2-inch-thick slices; spray slices on both sides with nonstick cooking spray. Set aside. 3 of 4 Heat gas grill to medium-high or prepare charcoal grill with medium-hot coals. Remove salmon from marinade; pour marinade into small saucepan and set aside. Grill salmon for about 5 minutes per side, or until opaque in the center; remove and keep warm. Add sweet potatoes and onions and grill for about 5 minutes. Turn and add asparagus; cook vegetables another 5 minutes, turning asparagus frequently. Test doneness of sweet potato slices with a knife. Sprinkle salmon and vegetables with salt and pepper. 4 of 4 Meanwhile, boil marinade in saucepan over high heat for 5 minutes, until thickened. 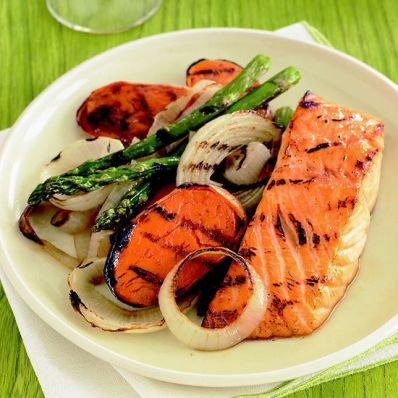 Brush salmon and vegetables with marinade.Note: If not using a grill basket, secure onion slices with a toothpick.